So this is a semi-official announcement – I am working on an arcade style game, working title “Pigeon Feed”. I had the idea for the game a little more than a year ago, and developed a few prototypes in different technologies before deciding on an approach. 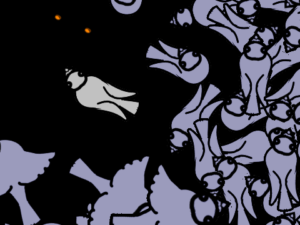 Don’t mind the poorly-drawn pigeons – those are placeholder graphics and will be much nicer before the game is done. Basic game mechanics: The player controls a pigeon that moves around the screen and eats food. Eating food refills a meter at the top of the screen, but when the meter runs out, it is game over. To make things difficult, there are other pigeons competing with you for food. Of course, you can scare them away pretty easily, but they will hold grudges. There are plenty more bonuses and challenges which I’m not going to go into right now, other than to say that the difficulty ramps up pretty quickly. I don’t yet have a landing page for it, or a press release or press kit, but will be working on all of that as I develop the game. My hope is to release the game on PCs (Windows, Mac, Linux), iOS devices and Android devices. I’ll keep posting updates here once a week, or maybe more often. 4000 Pounds is a thing. If you are reading this then you probably know me personally and I most likely forced you against your will to visit my new website, in which case you already know what this is all about. If that’s not the case and you somehow ended up here by chance, here’s the news: I am going to make some games for PCs, mobile devices, and consoles (hopefully). This site, and more specifically this blog, will be my place to promote my games. I know, the site’s not pretty now, but it’s a work in progress. Remember that I’m also working on games. Check back for updates, especially if you like to follow development blogs, as I’ll probably post a lot about things I’m working on for the technical crowd. Now to start making games.